Bilbao is one of the principal cities in Spain’s beautiful Basque Country. Compared to the aristocratic San Sebastian, Bilbao has always been considered the ugly, industrial step-sister. It was Spain’s most important industrial city and became quite gritty as a consequence. Things changed when Canadian born American architect Frank Gehry chose Bilbao as the site for the magnificently modern and almost space-age Guggenheim museum. The deal was negotiated between the New York-based Solomon R. Guggenheim Foundation and the Basque regional government. The result was one of the most impressive architectural achievements in Europe and a cultural renaissance in deindustrializing Bilbao. 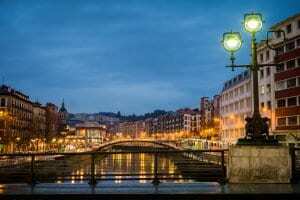 Bilbao suddenly appeared on the map of culture vultures, and a gust of creativity, commerce and confidence burst into Bilbao. The city of Bilbao was founded back in 1300, with the Magna Carta under Don Lopez de Haro. Before the town was “officially” founded, it had been home to settlements of Normans and possibly even Romans. Strategically located on the River Nervion, it has been an important commercial hub throughout the centuries. The industrial era turned Bilbao into one of Spain’s most important cities. Despite wars and invasions (Bilbao was invaded by Napoleon’s troops in the early 1800s and suffered four “Carlista” wars, not to mention the horrific Spanish Civil War), Bilbao continued to grow and grow. Hard times came upon Bilbao with the changing nature of industry in the “first world”. Big, dirty industry was no longer desirable in Europe, and Bilbao has been grappling with this reality for the last few decades. While still gritty enough, a visit to Bilbao is definitely worthwhile, if only to do two things- visit the Guggenheim and EAT! Basque Country is the culinary mecca of Spain, with the highest concentration of Michelin starred restaurants and famous chefs in the whole country, and in Europe at that. You could spend a week in Bilbao, munching your way through the city in bliss. Seafood and tapas (known as “Pintxos” in Basque Country) are the strongholds in the regional cooking, and the famous wine region of La Rioja is only an hour and a half away. There are plenty of smaller museums of interest to art lovers, and Bilbao is also a good base from which you can visit many beautiful Basque villages such as Getaria and Zarrautz and villages of historical importance such as Guernica. Bilbao is also home to many stylish new “Design Hotels” such as the Domine and the Miró. Visitors to Bilbao have an array of restaurants on offer, from the charming family-run “Victor’s” in the Plaza Nueva to the culinary powerhouses of Gorrotxa, Zortziko and Goizeko-Kabi in Bilbao proper and in the nearby villages such hotspots as Andra Mari and Aretxondo. The typical dishes of Bilbao and “Vizcaya” (the subregion of this part of Basque country) include “Cocochas” (hake cheeks), “Merluza en salsa verde” (hake prepared in a parsley and Olive Oil sauce, often with clams and/or baby eels), “Ensalada de Bogavante” (chilled lobster salad), and “Txangurro” (Crab, often stuffed in the shell. Other local delicacies include the top-class cheese “Idiazabal” and an assortment of wild mushrooms and truffles. Basque Country is home to the wine region of Rioja Alavesa (boasting such famous wineries as Marques de Riscal), to Txakoli (an interesting wine region, near the Atlantic ocean, known for zippy whites that pair perfectly with vinegary and garlicky tapas) and also, to cider. Basque cider is not as famous as the cider from Asturias, but it is extremely pleasant. The Basque cider houses open up to the public during cider season (January to April) and you can drink as much cider as you like and enjoy rustic dinners eaten at long communal tables. The wineries of La Rioja are also a pleasure to visit, some open to the general public, others only open to VIP groups. Only opened in 1997, the Guggenheim museum has completely and utterly transformed Bilbao. If you find yourself in Bilbao, a visit to the Guggenheim is “a must”. The permanent collection includes artists such as Richard Serra (who designed the “Snake”), Mark Rothko and Willem de Kooning. The restaurant at the Guggenheim is top class, reservations are essential. Located in the newer part of Bilbao, The Museum of Fine Arts is very charming and is, in fact, one of the best art museums in Spain. Artists featured include Bacon, Delauney, and Vasarely. There are plenty of relatively unknown Basque and Catalan painters on view. They have high profile temporary exhibitions, such as a recent showing of Rodin’s sculpture. The old town (dating back to the 14th century) is dominated by one main square, the Plaza Nueva (literally translating as the “new” square, as it merely dates back to the 18th century). The Plaza Nueva is full of Tapas bars, a perfect place to rest your feet and grab a glass of “Txakoli” wine and some “Pintxos”. There are frequent markets in the square, everything from food to old records and flowers. “Restaurante Victor”, right in the Plaza Nueva, is a wonderful non-pretentious restaurant with amazing seafood and an encyclopedia of a wine list.